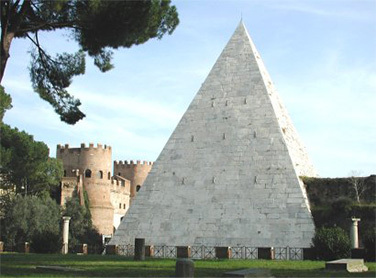 Even Rome have its pyramid, Cestius pyramid. It is located at Porta San Paolo and is one of Rome's best-preserved ancient buildings. The pyramid is the burial place of Caius Cestius Epulo and was built about 12 BC and according to an inscription on the pyramid the construction took 330 days. Originally the pyramid stood alone but later it become a part of socalled Aurelian walls. Although Cestius pyramid is small, only 36 meters, compared to the Egyptian original it's nevertheless impressive. It is placed next to Porta Ostiensis (now Pauls Gate or Porta San Paolo) that is visible behind the pyramid. A funny detail with the pyramid is that it is more pointed in it's proportions than the original Egyptian pyramids. That resulted in paintings that was supposed to show real Egyptian pyramids also became too pointy since the artist never went to Egypt (they cheated and used Cestius pyramid in Rome as a model). Thanks to Marco Prins and Kona Lendering who took the pictures! In the majority of Rome's buildings from the antiquity you find white marble as the dominant material. So even in the Cestius pyramid. C. Cestius L.F. Pob. Epulo pr. tr.pl. L. Ponti P.F. Cla. Melae heredis et Pothi L.
The pyramid was built around 18-12 BC as a tomb for Caius Cestius Epulo. It is built of concrete and is covered with smooth white marble stones. It is 36 meters high (100 Roman feet) and 30 meters at the base. The burial chamber in the pyramid measured 6x4 m with an height of 5 m. The walls of the burial chamber is decorated in a style that does not match the time of construction, and is believed to have been added much later. The pyramid has been looted, but the remains of two bronze sculptures have been found in the form of an arm and a foot. One guess is that the statue would have represent Caius Cestius. You can not visit the inside of the pyramid since it was re-sealed at the recent renovation in 1999. The pyramid originally stood for it self but later became a part of so-called. aurelian walls that was built as part of Rome's defense. The pyramid was also called Meta Remi (Remus cone). The pyramid is an attempt to imitate the Egyptian pyramids but the proprtions are wrong, it is to pointy. On the pyramid there are several inscriptions, one of which says, freely translated: "Caius Cestius Epulo, Lucius son of Pobilian, commander and officer of the official ceremonies. According to his wishes, completed work on 330 days and was built by his descendant L. Pontus Mela as the Publius from Claudian and his "freeslave" Pothus. Cestius pyramid is not the only one that existed in Rome. Thera was one at Borga near Castel Sant 'Angelo, but the marble that the pyramid was buit by was later used as stairs to the St Peter's Basilica. The pyramid at Borga was also called Meta Romuli, Romulus cone. The walls circumference is approximately 19 km and engulfed almost all of Rome. The walls were originally 8 feet high , but in some places they reached 10 meters, where it was strengthened and equipped with foxholes. The aurelian walls tha was build to protect Rome had towers about every 30 meters and totally, there were approximately 380 towers. The walls had approximately 2000 openings that was used för war machines and outcome ports. The Walls had 14 main gates, many of them heavily fortified with extra high towers. Construction of the walls marks the beginning of the end for the Roman Empire, a clear indication that power has weakened and that the "barbarians" threatened Rome itself. Porta Ostensia where the pyramid is located was originally two openings in the wall provided with arches. Later it was eventually rebuilt by Honorius and Arcadius. The towers were built even later by Mexentius. The obelisk that Constantius II had brought into the Circus Maximus 357 AD is believed to have passed through the port. Thanks to Marco Prins and Kona Lendering who took the pictures! !